General objective of this lecture is to presentation on Wind Power. 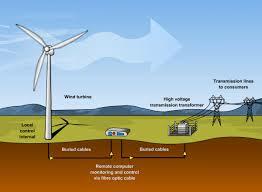 Here briefly explain Benefits and working process of Wind Power. The wind energy replaces electricity by coal-fired power plants thereby reduces greenhouse gases that produce global warming. Farmers can still utilize the land to graze cows, and receive land use royalties which have increased their land value. Use of wind turbines started around 200, used for pumping water and grinding wheat and other grains. The first windmill in the world built for electrical production was in 1887 in Scotland built by James Blyth.